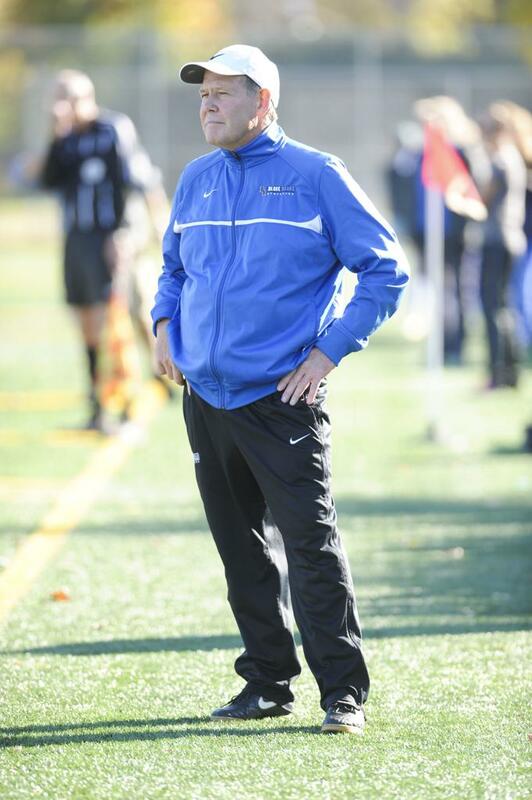 Head Girls' Soccer Coach Paul Menge has stepped down as program's leader after 31 seasons at the helm. Coach Menge will remain in his position as Assistant Director of the Upper School. Coach Menge stated "after many good years, being able to work with many great groups of kids, who made notable accomplishments both as individuals and as teams, the time just seemed right to do so. I'll continue in my role as Assistant Director here at Blake, and of course will continue to support our soccer teams as well. I'll also have more time in the fall to spend with my wife Kathy, who has been absolutely wonderful in encouraging my coaching over all of that time." Prior to Coach Menge's 31 years at Blake, he spent 10 seasons with Hill-Murray. Over his 41 season, Coach Menge recorded an impressive record of 360-89-26, including 10 State Tournament appearances (1997 A Runner-up; 1999; 2000 A Champion; 2007 A Runner-up; 2009 A Runner-up; 2010; 2011 A Champion; 2012 A Runner-up; 2013 A Runner-up; 2017). A search for the next Blake Girls' Soccer Coach is underway and will close on December 1, 2018.